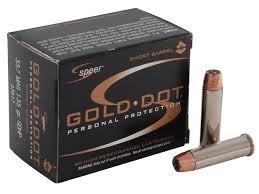 "Performance You Can Count On - Every Time"
Speer Gold Dot Short Barrel Ammunition is loaded with bonded core bullets and designed for home defense and personal protection. Bonding the jacket to the core means the elimination of core-jacket separations and superior weight retention. The nickel plated cases create a smoother functioning bullet and increased durability. This ammunition is new production, non-corrosive, in boxer primed, reloadable brass cases. Muzzle Energy: 294 ft. lbs. One (1) 20 round box.